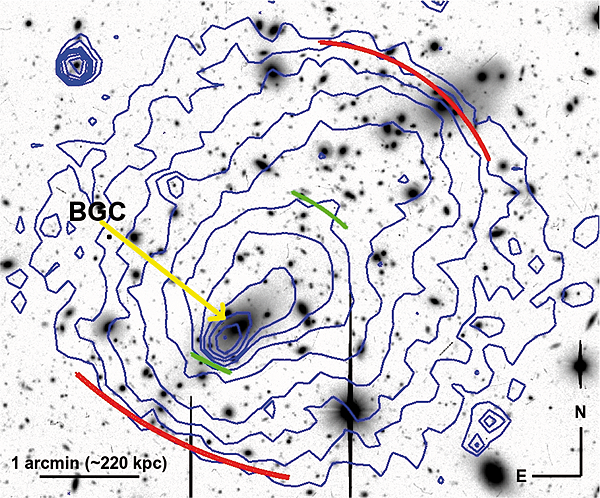 Observations using the OASIS integral field spectrograph on the William Herschel Telescope (WHT) have revealed a long, thin plume of ionised gas stretching out from the brightest cluster galaxy (BCG) of Abell 2146 (z=0.243) (Canning et al. 2012). 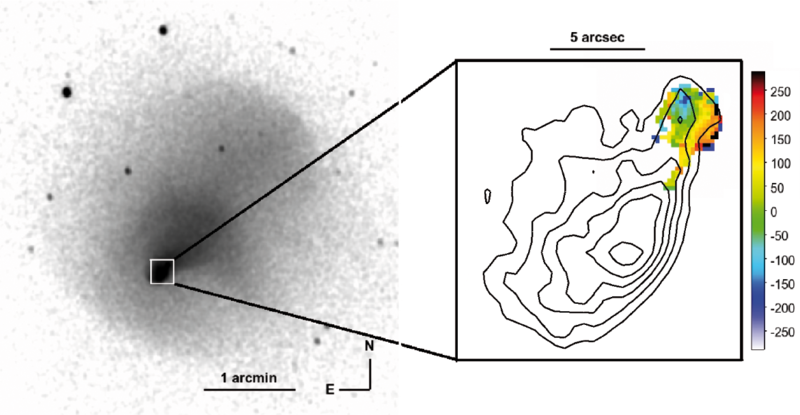 Extended optical emission-line nebulae are not uncommon in the cores of clusters, but the discovery of this particular structure is unexpected, as the host cluster is in the throes of a major merger event (Russell et al. 2010). How can a >15kpc long plume survive in the environment of such a turbulent intracluster medium? Chandra X-ray observations of the system show that a merging subcluster has created large shock fronts, each several hundred kiloparsecs across. These surround a dense, relatively cool X-ray core which is being stripped of its material in the collision. An optical image of the merging cluster Abell 2146 taken with the Subaru telescope. The morphology of the hot X-ray gas is shown as blue contours with the dense X-ray cool core unusually leading the brightest cluster galaxy. The majority of cluster galaxies are ahead of the X-ray gas, as expected in a galaxy cluster merger. The positions of the X-ray shock fronts are shown by the red lines [PNG | TIFF]. A peak of cool, dense X-ray gas is usually observed to coincide with the position of the dominant central galaxy in relaxed galaxy clusters. As it has a short radiative cooling time, material condensing out of the hot atmosphere is in a position to contribute to the growth of the dominant galaxy. In a merging cluster core, however, the situation is very different. During a collision between two clusters, individual galaxies can be regarded as effectively collisionless particles. Along with the dark matter component of the clusters, the galaxies thus lead the baryonic gas, which is slowed by friction after the main collision event. The centroids of the dark matter distribution (observationally traced by the galaxies) thus separates from the main baryonic mass component traced by the hot X-ray gas. Observations of this offset in the 'Bullet' cluster merger have provided some of the strongest evidence for dark matter. The situation in A2146 is unusual. While many of the member galaxies of the merging subcluster are located ahead of the X-ray peak, the dominant cluster galaxy lags behind. A large offset of 36 kpc is observed between the brightest cluster galaxy and the X-ray cool core. The new OASIS observations reveal a thin plume of ionised gas stretching out from the brightest cluster galaxy to bridge the gap to the X-ray cool core. The shape of the plume is tracked by a tail of cooler X-ray gas, linking the dense X-ray peak to the brightest cluster galaxy. This also means that the optical plume could trace an intermediate stage of gas cooling directly from the hot phase and on to the BCG from the X-ray cool core. Whether or not such a process results in significant star formation - thus contributing to the growth of the massive central galaxy - awaits further observation. A smoothed Chandra X-ray image of Abell 2146 showing the full gas structure. The insert shows the zoomed in image of the X-ray cool core and the brighest cluster galaxy. Low temperature X-ray gas is stripped from the core and coincides with a thin plume of ionised gas extending onto the galaxy. The plume is likely longer than observed and is truncated by the OASIS field-of-view. The colour of the ionised gas shows it's line-of-sight velocity in km per second; smooth low-velocities are observed in the plume while significant rotaion appears to be ongoing in the core of the galaxy [ PNG | TIFF ]. R. E. A. Canning, H. R. Russell, N. A. Hatch, A. C. Fabian, A. I. Zabludoff, C. S. Crawford, L. J. King, B. R. McNamara, S. Okamoto and S. I. Raimundo, 2012, "Riding the wake of a merging galaxy cluster", MNRAS, 420, DOI : 10.1111/j.1365-2966.2011.20116.x. Russell H. R., Sanders J. S., Fabian A. C., Baum S. A., Donahue M., Edge A. C., McNamara B. R., O’Dea C. P., 2010, MNRAS, 406, 1721.